BURGHLEY SIXES: Oundle oust holders, Nassington run-rate is 27 an over! Adam McDermott of Nassington with his 'champagne moment' prize. Hat-trick seeking holders Stamford were knocked out of the Burghley Park sixes at the first round stage last night (July 4). Stamford were handed a tough draw against new entrants from the Northants Premier Division in Oundle Town and so it proved. 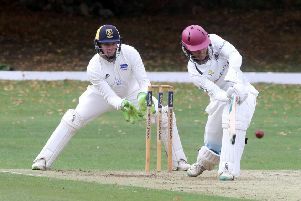 Pete Foster's 38 helped Oundle knock out Stamford. Oundle restricted Stamford to 66-4 before knocking off the runs in four of their five allocated overs. Pete Foster struck 38 for the winners. Oundle will now have the opportunity to topple last season’s runners-up Nassington who were the most impressive first round winners last night. Nassington piled up 135-1 in their five overs, an average of 27 an over! Conor Craig (62no) and Aussie Adam McDermott (51no) were the chief bullies against Laxton Park with the latter taking the night’s ‘champagne moment’ for striking five sixes in the final over of the Nassington innings. Nassington were 45-0 after one over thanks to several no balls and wides as well as some big hitting. Shell-shocked Laxton replied with 51-1. Ketton all-stars predictably beat Empingham by 61 runs in the other first round match played last night. Ulrich Van Duyker (35no) and Josh Gallimore (30no) did best in Ketton’s 92-1. Three more first round matches take place this evening with the host club kicking things off against Market Overton. The sixes continue all week with the semi-finals and final scheduled for Friday (July 8). Burghley Park host an all-day friendly each day this week (10am starts). Today (July 5) they take on an Authors XI. OUNDLE 67-1 (P. Foster 38) beat STAMFORD 66-4 (S. Prentice 24, A. Birch 20). Nassington 135-1 (C. Craig 62no, A. McDermott 51no) beat LAXTON 51-1 (I. Hales 29). KETTON 92-1 (U. Van Duyker 35no, J. Gallimore 30no) beat EMPINGHAM 31. First round: Burghley Park v Market Overton, Uffington v Ufford Park, Barnack v Uppingham.